Highlights from interviews given by Stephen Kenny, Sol Bamba, Scott Wilson, Jamie McCunnie and Adam Hammill after the Semi Final against Hibs at Hampden. Stephen is proud of his players effort and commitment although felt they didnt retain posession as well as they perhaps could have. 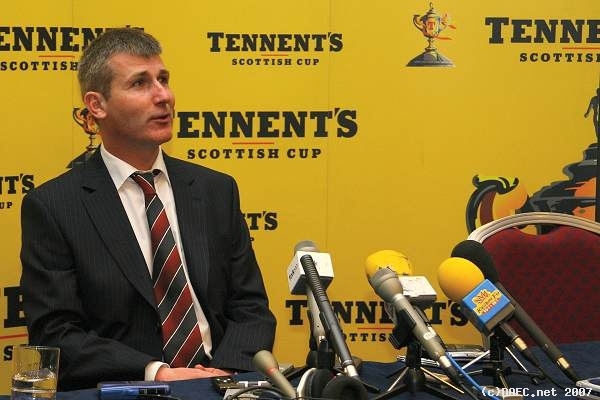 He is pleased enough with the result as he knows Hibs have the potential to be exceptional as they showed in the League Cup final against Kilmarnock. Although Hibs had more of the ball, Kenny believes his side had the most clear cut chances but failed to take their chances and luckily they didnt get punished for that. The fact that he will be missing a few players for the replay isnt as big a problem as it might seem as he`s confident they have good cover for the positions vacated. Sol thinks the team played well and he is pleased to have played his part by clearing a goal bound effort off the line. He is aware of the size and importance of the games coming up in the league and insists everyone is working hard in the run up to these games. Scott felt that the team had a few good chances to win the game but admits that Hibs players are probably feeling the same way. He says he only realised he was on a booking when he seen it in the programme so tried to ease himself into the game but unfortunately for him he did pick up a booking and will miss the replay. Wilson wants to try and get to the final to show that Dunfermline arent a bad side but knows that the league is the most important with the cup being a chance to get away from the doom and gloom of this seasons league duty. He gives alot of praise to team mate Sol Bamba and believes that the international games he has been playing has done him the world of good, especially playing along side the likes of Drogba and Toure. Jamie explains what happened with his effort that hits the post and admits he doesnt usually get chances to score. He feels that Dunfermline were the better team in the first half but that both sides had chances throughout the game. Jamie also points out how important the league games are and that the teams focus must be on them before their replay back at Hampden the following week. 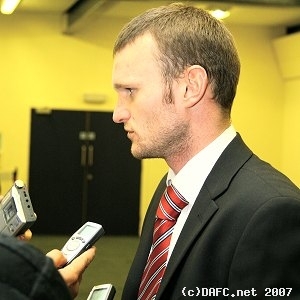 Scott Wilson speaking to the press - and DAFC.net! Adam talks of the width of the pitch and how he felt a little tight with his hamstring early on, however, he was fairly pleased with his performance but knew he could have done better. He was looking to go and attack the opposition but admits that the players could have given more support to sole striker McIntyre. Credit is given to the fans and although the stadium wasnt full Adam was impressed with the atmosphere and especially the Dunfermline fans who made it a great experience for the youngster.